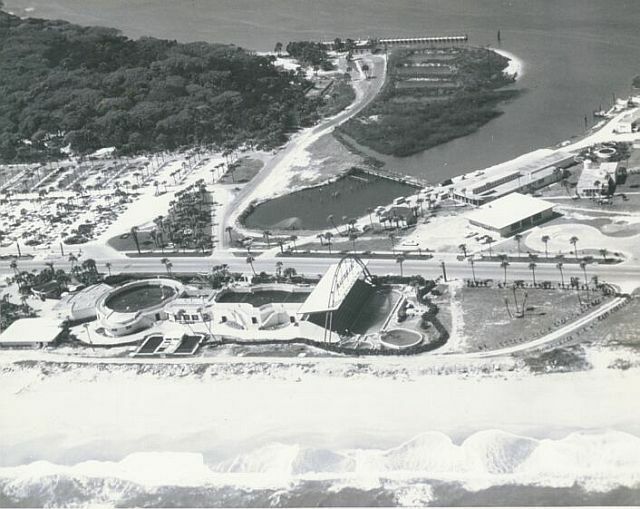 In 1936, 3 men ,W. Douglas Burden, great-great grandson of Commodore Vanderbilt and his cousin, Cornelius Vanderbilt Whitney and Ilia Tolstoy, grandson of Count Leo Tolstoy first conceived of a natural oceanarium , separated from the sea by a great steel net. This plan changed to that of construction on land of very large steel tanks containing fresh sea water. Glass windows placed at strategic intervals would afford the motion picture studios their first ideal opportunity for documentary photographing of sharks, porpoises, manta rays, sea turtles and many smaller animals of the sea. Assuming it was technically possible to build a large oceanarium on the land, the most crucial questions were : how to get the large animals like sharks and rays from the ocean into the tanks? Assuming this could be done, would the big and the little fish get on together in relatively confined quarters or would they eat each other? Collecting and transporting the fish, they decided, could be accomplished by means of special equipment such as trucks carrying large salt water tanks. Since there were no precedents to follow in planning a pioneering venture, there comes a time when problems have to be regarded as obstacles to be hurdled. The plans for the tanks that Burden and Tolstoy drew up looked like some of the improbable drawings that are filed daily with the United States Patent Office- and forgotten. They included rectangular, triangular, and circular tanks with arrows, asterisks, and explanatory details. Under the tanks would be all the mechanical paraphernalia for circulating water from the sea at the rate of several thousand gallons per minute. By the end of 1936 the plans were well along.